Chris Madaio, a member of the Boston Crusaders from 2002-2006, sent this picture. This is a picture of me - Chris Madaio (center), Phil Leisy (right), and Michael "Stu" Whitmore (left). Stu and I began marching in the corps in 2002 and were the conducting and in-line drum majors respectively in 2005 and 2006. 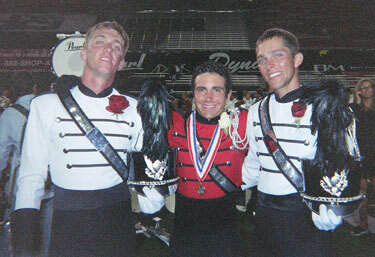 Phil started in 2003 and was also the conducting drum major in 2005 and 2006. It was the greatest privilege of my life to serve my fellow Crusaders with these two fine leaders. Some of my most treasured memories of drum corps took place behind the scenes with Stu and Phil doing whatever was necessary to take the corps to the next level. We had such a connection and understanding for one another that with just a glance at any point in the day, I would know exactly what the other drum major was thinking. We all aged out together this past summer at Camp Randall Stadium in Madison, Wis., which is where this picture was taken. It was truly an emotional moment knowing that I would never be able to work with these two great guys in the same way again. Stu and Phil ... you are giants.